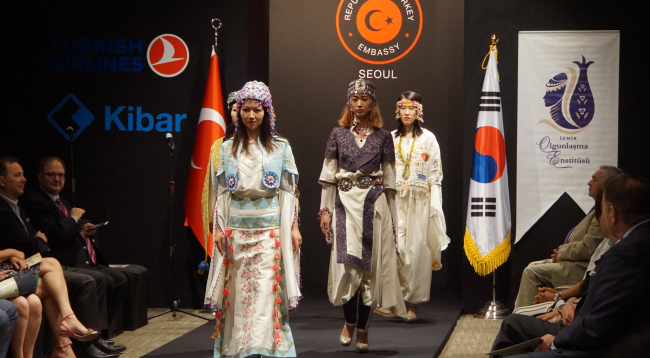 The Turkish Embassy held a fashion show Thursday at Hotel Shilla in Seoul, showcasing the country’s colorful wearables and embroideries worn by student models. The clothes were designed by Sule Aydan, the principal at the Izmir Olgunlasma Institute. “We enjoy excellent political relations,” Turkish Ambassador to Korea Ersin Ercin told The Korea Herald, adding that cultural cooperation was increasingly a critical component of the bilateral relations and gave a substantial boost to commercial ties. “After achieving the ‘economic miracle on the Han River’ from the ashes of war, I think the Korean leadership has taken a very wise decision to ride the next wave of development paradigm in cultural diplomacy,” he said. The event gathered several diplomats, including American, Thai, Spanish, Latvian, Bulgarian and Romanian ambassadors to Korea, as well as other dignitaries. Celebrated Korean actor Choi Bool-am was among the guests. Ercin said he had carefully observed the success of Korean pop-culture, globally known as Hallyu, adding that Korean TV dramas were popular in his country. Several Turkish movies and dramas have been based on Korean scripts, he noted. “We are trying our best to produce joint movies,” he said, pointing to South Korean cinema operator CJ CGV, which bought a nearly 40 percent stake in Istanbul-based Mars Entertainment Group, Turkey’s largest cinema chain, for $800 million in 2016. Last year marked the 60th anniversary of diplomatic relations between Ankara and Seoul, with a series of cultural events taking place in both countries. The year 2019 was designated as the year of promoting Turkish tourism in Korea during the visit here of Turkish President Recep Tayyip Erdogan in May. The Yunus Emre Institute, a Turkish public diplomacy institution created in 2007 to promote Turkish culture worldwide, will be established at Hankuk University of Foreign Studies in July. Its branches will also be inaugurated in Busan and Daegu. Noting that some 21,000 Turkish troops fought in the 1950-53 Korean War, with 1,000 of them paying their ultimate sacrifice and 1,400 sustaining injuries, the ambassador said the two nations were forged by blood -- hence the name “blood brotherhood” -- which added a visceral dimension to their historical ties. “Turkey, with its long history, rich culture and tradition and hospitable people, offers everything to pique the interest of Koreans, and vice versa,” he said.